Firstly, it’s hard not to notice that PremierFit T100 has sky-rocketed in sales. It deserves an applause for making sure that getting fit doesn’t need to be boring. PremierFit T100 can offer both entertainment and fitness at the same time. It has a wide range of features and is recommended especially for new users. Therefore, it is one of the best treadmills for 2018. First of all, this treadmill is quite compact as it has a dimension of 1100x400mm. Once assembled, the treadmill is L 134 x W 65 x H 104.5cm and L 40 x W 65 x H 132cm when folded. And of course, comes with conveyance wheels for easy transfers from one place to another. This means that it will be of appeal for those who do not have the luxury of space, for instance those who live in flats. 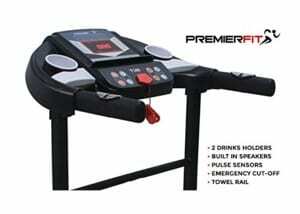 As promised, PremierFit T100 keeps fitness and entertainment combined. The iPad holder is very useful for those who wish to enjoy virtual treadmill workout groups. 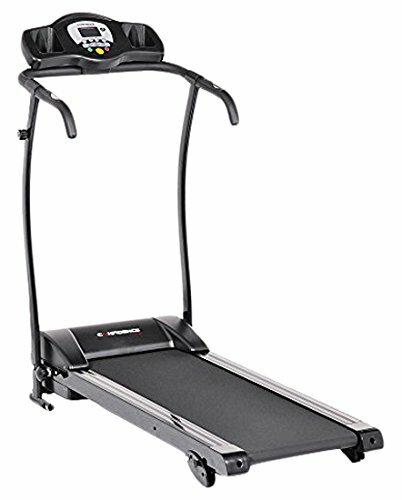 In addition to this, it has built-in speakers which you don’t usually find in other treadmills in a similar price range. This eliminates the need for headsets which you may find distracting as you exercise. Having 12 built-in programmes is indeed common, but what I like about this is that if none of the 12 presets suit you, there are 3 manual programmes in which you can customise. With this amount of workout programmes available, expect that weight loss, cardio, and perhaps even some sprint training. Warranty is something I always look for in everything I buy. This includes treadmills. And yes, I can easily find treadmills that pose warranties up to 12-months, but what separates the PremierFit T100’s warranty is that it goes up to 2 years on the frame and parts, and a lifetime warranty on the motor. Finding a lifetime warranty is rare even with the most expensive treadmills or other fitness equipment! For some reason, this gives me peace of mind knowing that my money is, in a way, secured. The magnetic safety cord stops the machine in case of emergency. Easy to assemble seems to be a regular in everybody’s checklist for treadmills to buy and the PremierFit T100 fits into this category. It has a maximum user weight of 90 kgs, although we admittingly like to stretch things out, it is proven to carry up to 100 kgs with ease based on customer reviews. 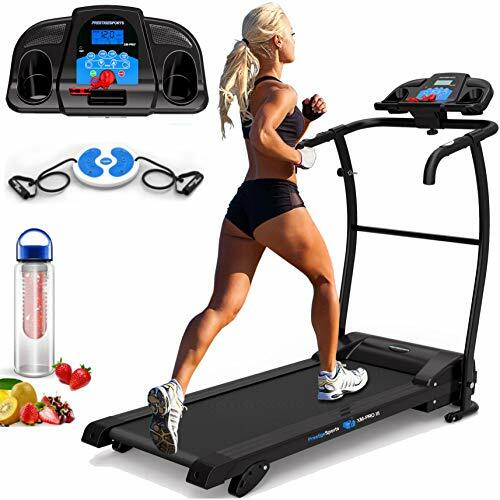 However, the console is pretty standard when compared with the most expensive models but considering the fact that it belongs in the mid-upper range of treadmill, you are already getting the most out of your money. As far as cons are concerned, I could only find one realistic area of opportunity for improvement. I consider this crucial since the intensity of workouts is at stake. The incline is fixed at 4%. Although this is the recommended level of incline, this limits the capacity of users to increase the intensity of the workout. For some reason, the PremierFit T100 is always being compared with Prestige Sport’s XM Pro III Treadmill and we can’t blame them. They are pretty identical in almost every feature except for a handful of differences. Although both treadmills have 12 preset workout programmes, PremierFit T100 has 3 manual customisable programmes whereas XM Pro III only has 1. PremierFit T100 has a fixed incline of 4% whilst XM Pro III has 3 adjustable incline levels.This means that XM Pro III would burn more fat if used at a given period of time. XM Pro III has a 2-year warranty on everything while PremierFit T100 has a 2-year warranty on parts and frame and a lifetime warranty for its motor. Maximum user weight for XM Pro III is 100 kg while PremierFit T100 only has 90. PremierFit T100 is priced a bit cheaper than XM Pro III at the time of review, perhaps because of the fixed incline issue. For a detailed review of XM Pro III, click here. It seems that one factor amongst the most in-demand treadmills is that they should have the ability to fold. 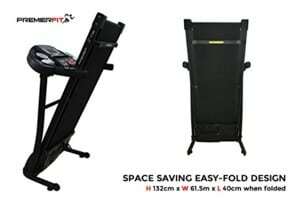 Another compact folding treadmill like the PremierFit T100 would be the Hi-Performance Electric Treadmill. It has a magnetic safety cord which you attach or pin to your shirt so that it stops in case you fall over or slip. Overall, this is a simple, no fuss, treadmill. The warranty is the first thing I noticed. The previous treadmills we compared have warranties that go for years whilst Hi-Performance Treadmill only has a year of warranty. It only has 3 preset workout programs which are significantly less than XM Pro and PremierFit T100. As a result, do not expect a variation in terms of your workout experience. Unlike the previous two treadmills we’ve compared, Hi-Performance Treadmill does not have music capability. 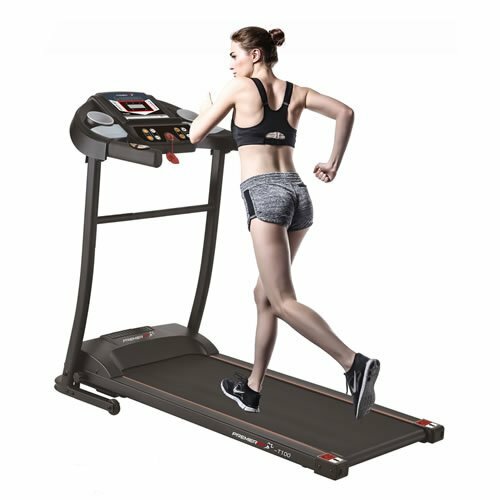 In addition, there’s not much to say about Hi-Performance Electric Treadmill since it is pretty straight-forward. With the discount it has during this time of review, this treadmill might be appealing for those who are on a tight budget. 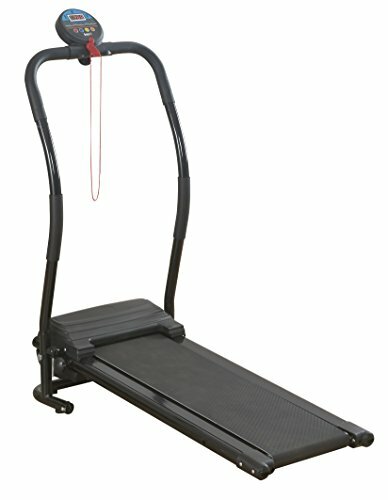 Bodyfit Folding Electric Treadmill is a lot cheaper than PremierFit T100 at the time of review. Although, it might just be on the same level like the Hi-Performance Electric Treadmill. This is a good choice for elderly people since the maximum speed is only 6 km/h. On the contrary, having this limited speed shows that it may not be suitable for running. You get what you pay for, a straight-forward treadmill that has 3 preset workout programs. Lastly, it comes with a 12-month warranty. What concerns me besides its lack of lustre is the functionality it offers. As you can see, there are no handrails and the console is quite small. Speaking of the console, it is pretty simple– as a matter of fact, too simple for my taste. Nonetheless, it still is a good buy for the right people. Besides the elderly, perhaps people who are recovering from a lower-extremity injury might find this a good buy. If you liked XM Pro III and PremierFit T100, then let us welcome Confidence GTR Treadmill. These three offer pretty much the same features and in the same price range. Confidence GTR Treadmill has a maximum speed of 12km/h. This means it is good for running. 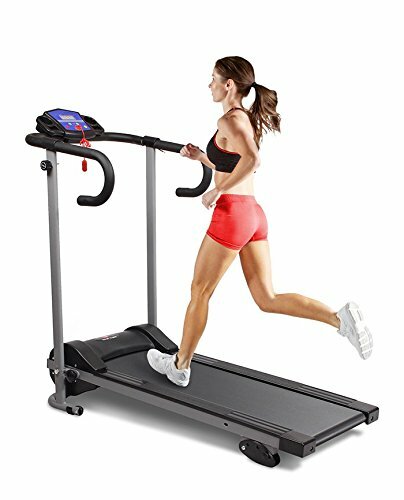 In addition, this treadmill has a better-looking and user-friendly console compared with Hi-Performance and Bodyfit treadmills. Furthermore, it has a safety feature as well in the form of an emergency cord. 3 levels of incline and 12 preset workout programmes will let you choose the intensity of your workout. Being easy to assemble gives a really good impression as seen with the customer reviews claiming that it can be assembled within 15-20 mins. So far, it has the best maximum user weight on this list which is 120 kgs. *for a detailed review, click here. So far, PremiereFit T100 Treadmill is looking to be a good buy. Again, you get 12 preset and 3 customisable workout programs. Honestly, I found the little details such as the iPad holder and music compatibility to be a plus as I see myself incorporating beast-mode every couple of days or so. But my favourite thing about this treadmill is the lifetime warranty in the motor, in addition to the 2 years for parts and frame.